Has Your Business Been Stopped from Using Google AdWords/AdSense? The National Shooting Sports Foundation sent out an email today regarding a class action suit against Google. If you or your business had their AdWords or AdSense account canceled as a result of advertising certain items including firearms, knives, and crossbows, you may qualify as a class action plaintiff in a lawsuit filed in San Jose, California. Read the full details below. If this pertains to you and your business, by all means investigate it. The othering and stigmatizing of those in the firearms, self-defense, and Second Amendment community by the large social media technology companies needs to stop. Hitting them in the wallet is one of the better ways to get them to back off. If your company was prevented from using Google AdWords/AdSense you are being invited to join a class action lawsuit that is now pending in federal court in San Jose, California. You do not necessarily have to hold an FFL to become a plaintiff in this lawsuit. Your business does not need to be based in California, it can be located anywhere in the United States. No attorney fees or costs will be charged to join this federal class action lawsuit. Rather, plaintiff’s counsel will be paid by court order on a contingent basis. If you are interested in learning more or in participating in the case you should directly contact William McGrane, Esq., who is acting as putative class action counsel in the pending federal class action lawsuit by emailing him at william.mcgrane@mcgranepc.com. Mr. McGrane’s contact information and biography may be viewed at www.mcgranepc.com. In the video below, Bill Wilson and Ken Hackathorn have a very interesting conversation on different types of holsters and what to look for when selecting one. They discuss the pro's and con's of the various styles and get into a bit of the history of some of them. For example, the Askins Avenger holster that came out from Bianchi was actually designed by holster maker Bruce Nelson and was designed to be worn cross draw. This is part of the Gun Guys series put out by Wilson Combat. Note - posting may be a little sporadic this week as I will be doing a bit of traveling. The Soylent Green Of Whiskey? My Wall Street Journal today included their "The Future of Everything" magazine. Featured on the cover was "synthetic spirits". That isn't something for Halloween but a lab-created whiskey from San Fransciso. The company is called Endless West and was founded by Mardonn Chua. Originally their intent was to recreate expensive wines. The problem was that they couldn't market them as wine under Federal law. However, due to a loophole in the regulations, they could create "spirit whiskey" so long as it contained 5% on a proof gallon whiskey. In the spring the company raised an additional $10 million and hired a small staff of food scientists and analytical chemists, then outfitted its lab with equipment that allows them to intricately sequence the molecular makeup of spirits (the machines are also used in food science and life science research). Though they keep the exact makes and models of these machines under wraps—going so far as to cover up their names with stickers reading “Bonnie” and “Clyde”—Lee let me tour freely throughout the lab. He showed me one machine that he described as “an electronic nose,” which inserts needles into half-filled vials of commercial wines and whiskeys, absorbs the gas trapped above the liquid, then “de-absorbs” the compounds to identify and quantify them. Endless West can then source these compounds, mixing and matching them to taste (and smell). To satisfy the Tax and Trade Bureau, Glyph contains some traditionally made whiskey. The bureau defines spirit whiskey as “produced by blending neutral spirits and not less than 5% on a proof gallon basis whiskey.” About 5% of Glyph consists of “distilled clean whiskey” that, according to Lee, isn’t noticeably distinguishable in flavor from pure ethanol. "Distilled clean whiskey" is, in other words, vodka to which they are adding flavoring to make "spirit whiskey". I don't think Jimmy Russell, Fred Noe, Harlan Wheatley, or Jim Rutledge have anything to fear from Glyph. About Those Mail Bombs Sent To Clinton, Obama, CNN, Etc. First off, while I heartily disagree with most anything Bill or Hillary Clinton and Barack Obama say, I condemn most forcefully whomever sent them - and others - what appear to be mail bombs. This is not how we do things in a republic. I'm sure whomever sent those will be found quickly and will be prosecuted to the fullest extent of the law. I'm not a bomb expert but it looks to be a pipe bomb using galvanized pipe to hold the explosive. If your mailpiece weighs more than 13 oz and you’re using postage stamps, take it to a Post Office retail counter to mail it. If put in your mailbox for pickup service, the carrier will leave it. If dropped in a blue collection box or lobby location, it will be returned to you. Moreover, if you look at that picture you will notice that the stamps are not cancelled with a postmark. That might be the failure of the post office or it might indicate that this device never was in the USPS mail system to begin with and was someone dropped off at CNN. I'm not going to get into conspiracy theories and suggest that the perpetrator was actually engaging in a false flag attack. I'll leave that to Alex Jones. I prefer to wait until we know just who was behind this. Regardless of who they are, I hope they spend many, many years behind bars. My series of Democrat state party platforms on gun control continues with Oklahoma, Oregon, Pennsylvania, Rhode Island, and South Carolina. As I have found, some state parties merely adopt the national platform as their own and this continues with this series of states. There used to be a tradition of Oklahoma Democrats being strong supporters of the Second Amendment and gun rights. Former Rep. Dan Boren (D-OK) is on the NRA Board of Directors and his father Sen. David Boren (D-OK) served on the NRA Board of Directors before him. That was then and this is now. The Oklahoma Democratic Party has adopted the DNC platform with its full agenda of gun control as their own. Given the state party doesn't have anything specific to say about gun control, it is important to look at the candidates for governor and attorney. Drew Edmondson is the current attorney general of Oklahoma. His website makes no mention of "gun violence" or "gun safety". However, he is on record elsewhere as saying that the age to purchase modern sporting rifles should be raised to 21. I support the Second Amendment and common sense regulations that are constitutional, reasonable, and in accord with the holdings of appellate courts. Guns must be stored safely and they must be out of the hands of the mentally ill. Mark strongly values the opinion of law enforcement and their role in keeping Oklahomans safe, and supports responsible gun ownership across the country. Hmm. "Common sense regulations" that are in accord with the holdings of appellate courts? I wonder how many Oklahomans are aware that the 9th Circuit has said you don't have a right to carry outside the home or that the 4th Circuit has ruled that certain semi-automatic firearms and their magazines are outside the Second Amendment. Moving from a state where politicians and the Democratic Party are circumspect about their intentions for gun control to a state where it is more explicit, the Democratic Party of Oregon's 2018 platform and legislative priorities call for gun bans (among other things). We support a ban on the civilian sale and purchase of military-style weapons and high-capacity magazines. 4. Ban the sale and purchase of military-grade and assault weapons, such as AR-15s, and equipment used to modify weapons into assault weapons. Limit magazine capacity to 10 rounds. Raise the minimum age of long gun purchases from 18 to 21. Fund and implement buy-back programs for those weapons and magazines. 6. Repeal the Dickey Amendment and resume public research into gun violence in the United States and fund comprehensive research to form evidence-based gun ownership and use controls. The Oregon Democrats have a number of caucuses including a Gun Owners Caucus. Reading their mission seems to be a mess of contradictory objectives. While they say they will push for a pro-2A legislative agenda, they then say they will support Democrats in office and those that are nominees. Gov. Kate Brown (D-OR) is a strong proponent of gun control having signed many gun control bills and calling for more. Attorney General Ellen Rosenblum (D-OR) is likewise a strong proponent of gun control. Those in the Gun Owners Caucus really can't have it both ways. As it is, they seem to function more as a fig leave for the gun prohibitionists than anything else. The Pennsylvania Democratic Party doesn't have a platform on their website and Ballotpedia says they adopt the DNC platform. Their "issues" page does not address anything dealing with firearms, gun control, or even gun safety (sic). Thus, let's look at what Gov. Tom Wolf (D-PA) says he wants on gun control. Like the party, he doesn't put gun control items on is campaign website. That said, he is where he stands according to the York Daily Record. Here's what Democratic Gov. Tom Wolf has said and done about gun control and the Second Amendment. increasing gun restrictions for defendants in domestic violence and protection-from-abuse cases. According to Uprise RI, the gun prohibitionists were upset that the earlier versions of the party platform of the Rhode Island Democrats didn't include gun control. The 2018 version adds this to the platform but the prohibitionists are upset it doesn't include a "assault weapon" (sic) and magazine ban along with language condemning attempts at national carry reciprocity. That said, the platform seems to be as bad as most. As Democrats, we respect the Constitution’s Second Amendment and its guaranteed rights for law - abiding citizens to keep and bear arms. At the same time, we recognize that there is a serious issue with gun violence in our country, and we support regulations regarding the safe use of firearms. We are proud of the thoughtful work that has been done in our state to ensure the safety of our children and our communities and we support passage of other common sense measures aimed at protecting the public from individuals who have demonstrated their inability to possess a firearm without putting others around them in danger. We believe that we must provide the public with the tools to be proactive partners with law enforcement to reduce gun violence. To keep our communities safe, Rhode Island Democrats insist that Congress enact legislation to require unlicensed gun sellers at gun shows and private gun dealers to conduct the same instant background checks that licensed dealers need to conduct using the National Criminal Instant Background Check System . Additionally, we support laws that protects our children and our families and will work to support common sense gun violence prevention measures. Finally, because we view gun violence as a public health issue, we also call on Congress to pass legislation allowing the Centers for Disease Control to study this issue. South Carolina Democrats passed a resolution adopting the DNC platform in its entirety as their own platform. To get a better idea of what the Democrats would do if elected, let's examine the positions of their candidates for governor and attorney general as those two positions would have the greatest impact on firearms legislation. The Charleston loophole refers to a FFL being allowed to release a firearm to a purchaser after three business days if a delayed response is received during the NICS check. Constance Anastopoulo is the Democrat nominee to face pro-gun Attorney General Alan Wilson (R-SC). She is the wife of Akim Anastopoulo whose personal injury ambulance chasing ads run daily on South Carolina TV stations. Before becoming a law professor at the Charleston School of Law, she practiced with her husband. She doesn't have anything on her website dealing with the issues. However, in announcing her intention to run, she said she would work to deny firearms to "domestic abusers". I know this seems to be a common refrain from the gun control lobby but it would seem to already be covered by the Lautenberg Amendment which makes anyone convicted of a misdemeanor of domestic violence a prohibited person. Fortunately, neither Smith nor Anastopoulo have much chance of beating the incumbent Republicans. The Estate Auction Of Lefty Kreh's Fishing Tackle, Signed Books, Etc. If you've flyfished for any amount of time, whether in fresh or saltwater, you know the name Lefty Kreh. He was an outdoor writer, photographer, instructor, fishing guide, fly designer, and all around ambassador for fishing but especially fly fishing. He passed away in March at the age of 93. I was privileged to meet Lefty at a Federation of Fly Fishers Conclave held in Gatlinburg, TN in the late 1990s as well as at a smattering of fly fishing expos. Now Lang's Auctions will be having a two-day online estate auction featuring his rods, reels, signed books, hand-tied flies, and other gear on October 27th and 28th. There are a total of 1,995 lots that will go up at auction at prices starting around $20. Bernard Victor Kreh (1925-2018), achieved much over the course of his career, attaining a level of celebrity that is unheard of in the angling world. A true pioneer of salt water fly fishing, he authored the definitive work on the subject, "Fly Fishing in Salt Water", published in 1974. 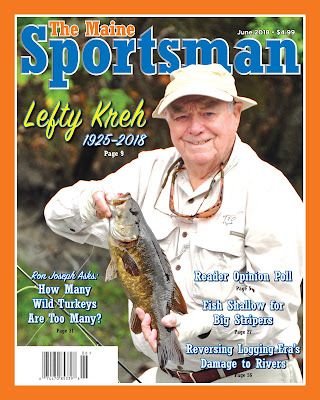 Known by most as simply "Lefty", Mr. Kreh held firm in his long-standing belief that the art of fly casting need not be difficult, and worked tirelessly to teach an untold number of students, from beginners to experts, his method of gracefully presenting a fly to wary fish. Making an impression early on while guiding angling author Joe Brooks for Maryland Smallmouth bass, Lefty soon embarked on a lifelong career of teaching anglers through personal demonstrations, television, video and lastly the internet, amid fishing with notables that included several U.S. Presidents, stars of stage and screen, and angling luminaries. In addition to his prowess with a rod in hand, Lefty was also known for his skill at the vise, creating the "Lefty's Deceiver", a deadly streamer used in both fresh and saltwater with equal effectiveness, earning the distinction of appearing on a Postal Service Stamp in 1991. An author of several books, outdoor writer for several publications, photographer of fishing locations and anglers for publication and creator of many important fly patterns, his influence on the angling world is undeniable. Respected by his peers, admired by all his students and loved by all that knew him, his ever affable personality was exceeded only by his skill with rod and reel. Lang's is proud to offer the collection of Bernard "Lefty" Kreh. Skimming through the auction I see boxes and boxes of flies, specimen flies that were used for photos in his books, books, rods, reels, and even a bunch of Lefty's trademark up-downer fishing caps. Some of this stuff actually belongs in the American Museum of Fly Fishing. That said, this auction gives you the opportunity to own not only some of Lefty's gear but sample flies sent to him by some of the great fly designers of all time. The estate auction can be found here. Ian McCollum has a Forgotten Weapons video up on a the S&W M-76 9mm submachine gun. The M-76 is a close copy of the Swedish K that was used by Navy SEALs and other special forces in the Vietnam War. They had to go to S&W for a copy of the Swedish K after the Swedish Government refused to sell any more to the US military due to their objection to the Vietnam War. I have been fortunate enough to have fired one of these submachine guns and I really liked it. Years ago, LuckyGunner ammo put on a blogger shoot in East Tennessee and this was one of the full-auto firearms available to shoot. I found it easy to handle and quite a fun way to waste ammo. If I ever decide to take the full-auto plunge, it is one of the firearms on my semi-affordable buy list. Early in the Vietnam War, the US Navy acquired a quantity of Swedish M/45B submachine guns (“Swedish K”) for special forces use. By 1966, however, the Swedish government would no longer authorize sales of arms to the United States because of involvement in the Vietnam War. So instead, the US turned to Smith & Wesson to design and produce a copy of the gun. In January of 1967 the first prototypes were presented of the S&W Model 76, which incorporated a number of changes form the Swedish original. The S&W gun had an ambidextrous selector lever allowing either semiauto or full auto fire, and a permanently fitted magazine well for use with a close copy of the Suomi 36 round double stack box magazine. Most interestingly, the inside of the receiver tube is cut with long rifling-like grooves to allow dirt and fouling to accumulate without impacting the gun’s reliability. Only a relatively small number of 76s were procured by the Navy (under the designation Mk 24 Mod 0), as the availablity of AR15/M16 carbines proved more attractive option than 9mm submachine guns. The company would continue making them until 1974, with a total of 6,000 produced. This particular example is a T prefix serial, which I suspect (but cannot prove) was Navy purchase. The reputation of the S&W 76 has been unfortunately tarnished by a succession of full auto and semiauto clones, none of which are as well made or as reliable in use as the original S&W production. The M-76 that Ian is showing in the video is up for auction by Morphy Auctions. Checking the latest auction bid, it would take you at least $4,000 plus the 26% and the $200 tax stamp to take this home. Still when you consider that no new NFA machine guns are coming on to the market that you can buy (thank you, Hughes Amendment), this is a quite reasonable price. I'm pushing to finish this series before early voting starts in most states. In North Carolina, it starts on October 17th. This group of platforms will include those of the Democrat Parties of New Mexico, New York, North Carolina, North Dakota, and Ohio. It is an interesting mix composed of three top-10 in population states along with two rather small states. Given this background, it is not surprising to see a whole litany of gun control proposals in this platform under "Public Safety". As a side-note, this section also has quite a bit about nuclear arms contained within it including challenging the unilateral authority of the President to use nuclear weapons. New York is home to the NY SAFE Act which was rammed through the legislature in the immediate aftermath of the Newtown murders. Thus, the platform of the New York State Democratic Committee is more of a patting on the back for what they've done than a what we intend to do in the future. The state's gun control laws are already draconian so there is little more that could be added. As a lifelong North Carolinian and former Democrat, I'm not surprised by what I've read in the North Carolina Democratic Party's platform. The party that was composed of moderate and conservative Democrats has been fully taken over by the left wing. That trend started in 1972 with the McGovern campaign and went into high gear in the 90s and early 2000s. Some of this was indigenous and a good bit was due to in-migration from the Northeast. 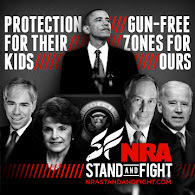 GUN VIOLENCE PREVENTION As Democrats we recognize that there is a serious issue with gun violence in our country, yet we also respect the Constitution’s Second Amendment. We believe the promotion of standards to curtail gun violence is not inconsistent with the Second Amendment. Among the measures we support are strengthening background checks, closing loopholes such as the well-known “gun show loophole,” holding gun manufacturers accountable through repeal of their special immunity status, and keeping guns out of the hands of dangerous individuals. We believe that responsible gun owners should not be punished for the wrongdoing of those who seek to do harm, but that we must also take proactive measures to slow and eventually eliminate this epidemic in our country. We support the fundamental rights to freedom of speech, freedom of religion, freedom of association and assembly 2016 North Carolina Democratic Party Platform and the right not to be deprived of life, liberty, or property without due process of law. We oppose efforts to limit or eliminate these fundamental constitutional rights. They are big on the freedom of speech and assembly parts as evidenced by the "Moral Monday" protests but are paying lipservice to the taking of property without due process of law. The red flag law proposed by Rep. Marcia Morey (D-Durham) provides for ex parte orders taking a person's firearms. This means a judge issues an order based upon what a family or household member or LEO says without the person whose guns are being taken being involved in the hearing. It is only days later that the person who is the subject of the order gets to have their day in court. North Dakota Democrats are moving right along with the rest of the national Democrats in their support of gun control including age discrimination, training requirements for a first time purchase, waiting periods, and universal background checks. The NPL in the name of the North Dakota party is the Non Partisan League which merged with the Democrats back in the 1950s. Firearm Safety – The Dem-NPL Party supports common sense regulations regarding the safe use of firearms for North Dakotans. The Dem-NPL supports legislation to close the loophole stating that it’s legal to sell and buy modification kits that can convert semi-automatic weapons into automatic ones. The Dem-NPL supports requiring North Dakota unlicensed gun sellers at gun shows, and private gun dealers to conduct the same instant background checks that licensed dealers need to conduct, using the National Criminal Instant Background Check System. The Dem-NPL Supports school Resource Officers who are trained in law enforcement, and in adolescent behavior. The Dem-NPL supports secure processes for students and adults to anonymously report suspected gun violence behavior, along with organized community forums where groups can share ideas, parents and kids can learn where to turn for help, and training is provided in the community to learn the signs of potential danger, and provides information on how to seek out interventions. The Dem-NPL supports a mandatory Certified Firearm safety training for any first time purchaser of a firearm. The Dem-NPL supports increasing the age to purchase a semi-automatic weapon from 18 to 21, and require a 3-day waiting period to purchase. I presume that Item 1 refers to bump fire stocks as any other kit or sear would come under the National Firearms Act. Likewise, there is no such thing as a private gun dealer. You either are a licensed dealer or you are a private individual selling or trading your personally owned firearms on occasion but not as a business. This is an indication to me that whoever wrote this was unfamiliar with federal firearms law. The Ohio Democrats have adopted the national DNC platform as their own and have not written a separate Ohio-specific platform. Therefore, to get an idea of what Ohio Democrats will do let's look at the platforms or issue statements of Richard Cordray who is their candidate for governor and of Steve Dettelbach who is their candidate for attorney general. These seem to me to be the two major offices impacting firearms rights in the Buckeye State. Appoint a "gun violence protection czar"
Create "gun violence task forces"
Bear in mind that Cordray was Sen. Elizabeth Warren's handpicked choice to head the Consumer Financial Protection Bureau which should show where he aligns politically. Moreover, in the state where the FASTER program began, he says he is against arming teachers and administrators regardless of whether they were former military or law enforcement officers. He says, "I think this is a politician’s plan quite frankly I mean it doesn’t protect people in any meaningful way it’s more than a day late and much more than a dollar short." I guess he is ignorant of the studies that have shown the speed of response is key to saving and protecting students. The series on the state party platforms of the Democrat Party continues with Montana, Nebraska, Nevada, New Hampshire, and New Jersey. The right to keep and bear arms as defined in both the Montana and the U.S. Constitutions. That section goes on to say that they support public hunting as a game management tool. Responsible ownership of firearms, including gun safety practices and the education and supervision of children in the use of firearms. That sounds good until you read their action agenda which says they will "Advocate policies that address and prevent gun violence." The very use of the word "gun violence" (sic) indicates to me that they are blaming the firearm and not the person misusing it. While Montana Democrats are somewhat circumspect about advocating for gun control, Nebraska Democrats are anything but circumspect. Their platform calls for gun bans, a raise in the age to purchase a firearm to 21, red flag laws, an end to state preemption, and the elimination of the Protection of Lawful Commerce in Arms Act among other things. Nebraska Democrats recognize that gun violence is a serious problem that claims the lives of tens of thousands of Americans per year, injures many more, traumatizes countless others, and disproportionately impacts communities of color. We support the right of Americans to live free of gun violence. We recognize that gun violence is the consequence of an inadequately regulated consumer market. We support the repeal of the federal Protection of Lawful Commerce in Arms Act (PLCAA), which offers special immunities from liability to gun manufacturers and sellers and deprives injured persons from their right to legal remedy in the courts. Nebraska Democrats support the right of communities to respond democratically to gun violence by passing local ordinances to address their needs. If gun s are owned, they must be used responsibly. We support criminal and civil liability for those who do not safely secure their guns. We support a tax on weapons and ammunition to fund school security measures. We agree with the American Medical Association ’s proposals regarding firearms: limiting the purchase of guns to individuals 21 and over; supporting legislation that allows relatives of suicidal people or those who have threatened imminent violence to seek court - ordered removal of guns from the home; requesting better training for physicians to recognize patients at risk for suicide; and ensuring domestic abusers do not have access to firearms. The Nebraska Democratic Party further supports the American Academy of Pediatrics’ proposals to enact a strong, effective assault weapons ban, require mandatory background checks and waiting periods of all firearm purchases, enact a ban on high - capacity magazines, enact strong handgun regulations, and require safe firearm storage under federal law. We support scientific research into gun violence by the National Institutes of Health, the Centers for Disease Control, and other research agencies. It should come as no surprise that Nevada Democrats have gone full on gun control. They supported Bloomberg's universal background check initiative and now are calling for much more gun control after last year's Mandalay Bay murders. The days of a more libertarian approach to firearms by Nevada Democrats is long over especially with the number of immigrants from California. As to the Mandalay Bay murders, a motive is still not known and all the firearms were purchased legally including the bump fire stocks. We support common sense gun safety and gun violence prevention measures, because what happened on 1 October must never happen again. We support the right to bear arms in a responsible manner. We oppose “Stand Your Ground” laws. We support banning bump stocks or any device that makes a semi - automatic weapon fire like an automatic weapon. We support a ban on assault weapons and high capacity magazines. We support outlawing guns on school campuses and keeping guns out of public and government buildings. We support technology aimed at keeping children safe and ensuring that firearms are stored safely in gun owners’ homes. We support the implementation and enforcement of the ballot initiative that was approved by the voters in 2016 to close the gun show loophole. We oppose any efforts by the Nevada Legislature to make it easier for potentially dangerous people like convicted domestic abusers , violent criminals , stalkers , and those lawfully adjudicated as mentally ill to have easier access to weapons. We support strict standards on reciprocity laws in Nevada that protect our families and visitors. We support reporting gun injuries and deaths as community health problems, and keeping statistics and studying those statistics as a public health issue. The days of New Hampshire being the bedrock of New England conservatism is over. You can thank tax-avoiding migrants from Massachusetts for this. The New Hampshire Democratic Party's platform does reflect this. I will say I'm a bit surprised that they haven't called for an end to constitutional carry but that could reflect its popularity with voters. We believe in universal background checks to protect our communities from gun violence. We believe that military - style weapons, bump stocks, and high - capacity magazine s do not belong on our streets. We believe in the establishment of gun - free zones in certain public places, such as schools , as a means of reducing gun violence. We support a ban on guns in and on the floor of our State House for the safety of our residents, guests , and children who visit . I do hate to break it to whomever wrote this platform but so-called gun-free zones do not reduce "gun violence". They only put law abiding people at risk from predators and other psychopaths. I think it was gun law attorney Evan Nappen who once said New Jersey is where gun rights go to die. He's probably right. The NJ Democratic Party doesn't publish a platform and according to Ballotpedia uses the Democratic National Committee's platform. Given that, let's look at the platform of Gov. Phil Murphy (D-NJ) when it comes to guns. He's the key figure in state government so could have to the biggest - and worst - impact on gun rights in the Garden State. It includes a laundry list of things ranging from taxes on guns to so-called smart guns (sic). Sign commonsense legislation that Christie vetoed: Phil Murphy would start by signing every piece of gun violence prevention legislation that Governor Christie has vetoed. These bills would have enacted bipartisan and sensible solutions, such as keeping guns out of the hands of gang members and domestic abusers. Mandate gun safety training: No one should be able to purchase a firearm without first attending a gun safety training course. Promote smart gun technology: We must regain our position as a leader in the smart gun movement by requiring all gun retailers to carry at least one smart gun once they are commercially available. Keep guns out of the hands of those suffering with mental illness: New Jersey already requires background checks, but it should follow the lead of nearly half the states in the U.S. and require timely reporting of mental illness episodes to the national background check database. Tax gun sales to prevent violence: All gun sales should be subject to a tax that will fund law enforcement, drug treatment centers, and mental health services. Strengthen regulations on gun transfers: Phil Murphy would make it a crime to sell guns without conducting a mandatory background check, and would require individuals to register their firearms kept in the state. Work with neighboring states to promote gun violence prevention: An estimated 80 percent of guns involved in crimes in New Jersey come from out of state. As governor, Phil Murphy will engage partners in neighboring states to find common ground on gun violence prevention efforts. Direct the Attorney General to vigorously defend our gun laws: Governor Christie has allowed the Attorney General’s office to relax enforcement of our gun safety laws, including laws that prohibit illegally transporting guns into New Jersey from out of state. As governor, Phil Murphy would direct the Attorney General to vigorously defend and enforce our gun laws, rather than to act as an agent of the NRA. With the exception of getting tough on gang members, there is not a thing in that list which would reduce criminal misuse of firearms. It is aimed at the law-abiding gun owner and not the criminal. As we have also seen, Murphy is actively anti-hunting with his ad hoc ban on hunting of bears on state lands. Murphy doesn't even pretend to make lip service about supporting hunters. 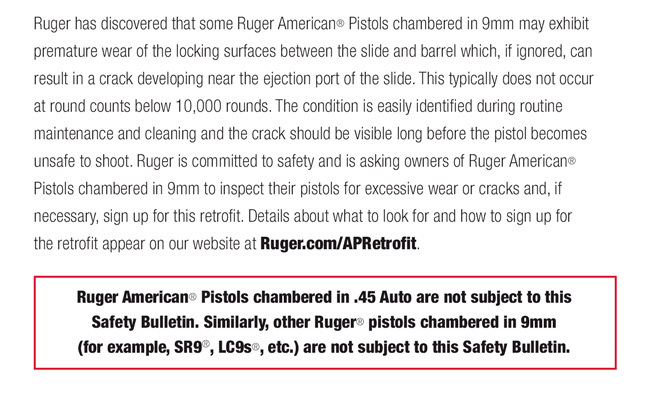 Ruger has issued a safety bulletin for their 9mm Ruger American pistols due to premature wear on locking surfaces. It only applies to the 9mm Ruger American model and not those in .45 ACP. Eric at IV8888 mated a Brownells Retro XM177E2 upper with a full auto M-16 lower. The fun you can have with full auto! No pumpkin, soda bottle, or watermelon is safe. Just think, if we didn't have the Hughes Amendment, we could get new full auto lowers or even complete guns. Continuing on with my series of posts detailing the position of the individual state Democratic Parties on firearms, we move on to a quintuplet of "M" states. The Massachusetts Democratic Party platform actually has very little in it regarding firearms. My supposition is that it was created in 2017 before red flag laws came into vogue and, perhaps more tellingly, because Massachusetts already so much gun control. Preventing gun violence through universal background checks and a ban on assault weapons and high-capacity magazines. This was from the section entitled, "Public Safety and Crime Prevention", which deals more with the militarization of the police, community policing and corrections, and the like. Enact common sense gun safety measures. Democrats recognize the Constitutional right of Americans to keep and bear arms under the 2nd Amendment. The vast majority of Michigan gun owners are responsible citizens and sportsman that value the strong Michigan tradition of hunting and safe use of firearms. Democrats, along with vast majorities of the American public, support common sense gun safety proposals like closing the gun show loophole and preventing potential terrorists from purchasing firearms. If an individual is deemed too dangerous to fly, they should be too dangerous to buy a gun. Democrats also support banning military style weapons, like the AR-15, which has been used in mass shootings in Sandy Hook, Dallas, Orlando, and across the nation. The Michigan Democrat's platform was one of the first I remember seeing advocating using the "no-fly" list to make one a prohibited person. Reasonable firearm policies that promote public safety and crime prevention without infringing on the rights of hunters and other sports enthusiasts. Now the question as to what is a reasonable policy is open to discussion. I would call attention to the fact that they don't want to infringe "on the rights of hunters and other sports enthusiasts". They say nothing about those who would use a firearm for self-protection and self-defense. This is interesting as this section also calls for mandatory sentences for drug dealer and rapists as well as stiff penalties for child abuse. The Minnesota DFL webpage does have an endorsement of March for our Lives and condemns the NRA. That might give you a better feel for what the DFL considers "reasonable firearm policies." The Mississippi Democratic Party platform was adopted in 2016 and make absolutely no mention of firearms or gun control. It concentrates much more on education and voting rights. Given the history of voting rights in Mississippi in the 1960s, this is understandable. The Mississippi Democratic Party web presence is a mess. They still have an active website the basically stops in 2008, the one they publicize on Twitter - http://www.mississippidemocrats.org - goes to a suspended webpage, and the one I got the platform from calls itself the classic Mississippi Democratic Party page. Perhaps not surprising given that Ferguson was in Missouri but the platform endorses Black Lives Matter, body cams for cops, eliminating minimum sentences, and training in non-lethal techniques for police. It also calls for full restitution of voting rights and the ability to hold public office after a sentence is served. Phillip Price is the Democratic nominee for Congress in the 11th Congressional District of North Carolina. He will be facing incumbent Rep. Mark Meadows (D-NC-11). I would be in Meadows' district if I lived a mere 10 miles further south. Price owns a company that deals in reclaimed lumber as well as continues to be a touring musician with his band called D. S. F. Earthcorps. He is also a self-proclaimed hunter and has been running the following ad on local TV stations saying no one is coming for his guns or your guns. Our schools, churches, movie theaters and concert venues are becoming targets for gun violence, and it is no longer enough to offer thoughts and prayers. We need change, and it is up to our elected officials to create it. That’s why I support sensible gun reforms. I want to close the loopholes on background checks to buy weapons and ban gun purchases for those who have a history of domestic violence, violent mental illness or animal abuse. We must restore the ban on those semiautomatic weapons that have been used in so many attacks, and get rid of the large capacity magazines and bump stocks that make it even easier to hit multiple victims so quickly. I’m a hunter and a gun owner and I stand with most Americans who already support these commonsense changes in policy. After reviewing the campaign’s stance, I recently received the Moms Demand Action Gun Sense Candidate distinction, acknowledging my support for real reform. If my vision reflects your vision, won’t you please volunteer or contribute to our campaign? Working together, our vision can become reality. Not coming for your guns? Really? He says one thing on TV and figures he can tell the real story on his website because few people will read it. Given his past run-ins with the law regarding marijuana possession, there are real questions as to whether he is a prohibited person or not. I don't think most voters would take kindly to a prohibited person telling them they can't have a semi-auto rifle, pistol, or carbine. Would you? Kimberly Strassel is a journalist and member of the Wall Street Journal's editorial board. Unlike many in her profession, she is a conservative. Moreover, she has been steadfast in her support of Judge Brett Kavanaugh and has been very vocal about it on Twitter. Yesterday, Sen. Lisa Murkowski (RINO-AK) broke with her Republican colleagues and voted against invoking cloture on the nomination of Judge Kavanaugh. While saying that Kavanaugh was a good man she said he was not the right man for the Supreme Court "at this time". Strassel, in a pair of tweets, points out what Murkowski is really standing for. --to abandon due process and presumption of innocence. --to potentially leave High Court at a 4-4 deadlock, putting the loony 9th circuit in control of everything that matters to Alaska--development, prop rights, gun rights, enviro rules, etc. The Senate voted 51-49 to invoke cloture on debate regarding the nomination of Judge Brett Kavanaugh to replace Justice Anthony Kennedy on the Supreme Court. This means that a final vote can be taken as early as Saturday afternoon. Cloture was invoked at 10:36am EDT which started the 30 hour clock on debate. If the Democrats relinquish the floor at anytime during that 30 hour period, the final vote can be called. The only Democrat to vote for cloture was Sen. Joe Manchin (D-WV) while the only Republican to vote against it was Lisa Murkowski (R-AK). Manchin is up for re-election this year while Murkowski doesn't have to face Alaska voters until 2022. President Trump won both states in the 2016 election. 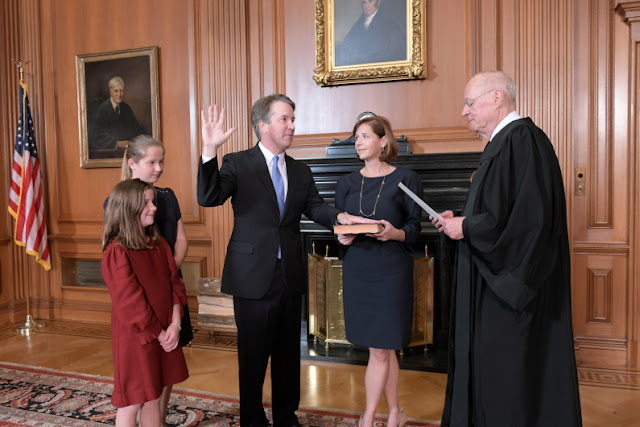 If this vote holds without any more Republican defections, then Judge Kavanaugh will become Justice Kavanaugh. The one wrinkle in this right now is Sen. Steve Daines (R-MT) who plans to be out of town on Saturday to attend his daughter's wedding. Too bad she didn't have a June wedding! October 4th in National Vodka Day. I'm old enough to remember when vodka came in one flavor. Now you can get flavors ranging from birthday cake and bubble gum to virtually any flavor of citrus you could come up with. I'm not a vodka aficionado. It serves its purpose in some cocktails like a Bloody Mary but that is about it. I'm more of the opinion of author Fred Minnick as expressed in his tweet today. Happy National Vodka Day: Pour it in the drain. And drink bourbon. Moreover, as Liberty Pole Spirits makes clear in this tweet, there never was a Vodka Rebellion. I think the primary purpose of vodka was to keep the serfs from rising up and even that failed. Now that we have to wait on the FBI investigation of Judge Brett Kavanaugh, it is time to continue my series on party platforms. This post will look at the Democrat Party platforms for Kansas, Kentucky, Louisiana, Maine, and Maryland. When I finish this series on the Democrats, I plan to do a similar one on Republican state party platforms. Gov. Sam Brownback (R-KS) signed permitless concealed-carry into law in 2015. Last year, campus carry was legalized as of July 1st. Bear this in mind when reading what Democratic Party of Kansas has to say on firearms. From the addendum to their platform adopted in 2018. In other words, they object to all the progress on gun rights passed in Kansas over the past few years. The Democrat Party of Kentucky does not publish a platform on its webpage. According to Ballotpedia, they merely adopt the national Democrat Party's platform. Some Kentucky Democrats have suggested a platform but I can't find any evidence of one being adopted. The national platform has this to say about "gun violence" (sic). Like Kentucky, the Democrat Party of Louisiana does not publish a platform on its webpage. Again, like Kentucky, it merely adopts the national Democrat Party's platform. A search of their website for "platform" turns up only elections to the platform committee of the national convention. I'm sure most in Louisiana do not agree with the national party's platform regarding firearms. That might explain why there is only one Democrat congressman from Louisiana and Gov. John Bel Edwards ran for election on a pro-2A platform. Maine used to be a state where the Democrats were pro-gun and most of the state outside of southern Maine is still relatively pro-gun. Voters in Maine did turn down a Bloomberg sponsored and financed referendum calling for universal background checks. Moreover, the state joined New Hampshire and Vermont in approving permitless or constitutional concealed carry. However, the platform of the Democratic Party of Maine does contain calls for more gun control even if they call it gun safety (sic). 5. Ensures responsible gun ownership in accordance with the 2nd Amendment of the U.S. Constitution and works to strengthen background checks for every firearm sale within the State of Maine and promotes the restoration of gun safety research..
As Democratic state party platforms go, that is relatively weak stuff. Given that Maryland has a plethora of gun control laws including requiring a class in order to purchase a handgun, a mag ban, and a ban on modern sporting rifles, it should be surprising that the Maryland Democrats have come up with even more things they want in the name of "gun safety" (sic). Sadly, it isn't. The Maryland Democratic Party devotes a full webpage in their Issues section to gun control. Democrats support Americans’ Second Amendment guaranteed rights of law-abiding citizens to keep and bear arms. We also believe the government should pass sensible laws that stem gun crimes, violence that too often destroys families and communities. A staggering 89 percent of unintentional, fatal shootings of children occur in the home. Guns and domestic abusers are a deadly combination. Of women killed by men, more than 90 percent are killed by a man they knew personally. At least 62 percent are killed by an intimate partner. Over the past 25 years, more intimate partner homicides have been carried out with guns than with all other weapons combined. No law will prevent all gun crimes, but that doesn’t mean we shouldn’t implement sensible gun regulations that strike a balance between liberty and safety. Currently the law prohibits a convicted domestic abuser from purchasing or possessing a gun, but the law does not provide a timeline for forfeiture or a requirement of proof of forfeiture. General Assembly Democrats are leading the fight to require abusers to forfeit guns within 48 hours and to give notice of forfeiture within 5 days. I searched their webpage for any mention of the murder rate in Baltimore, gang violence, or even crime (other than "gun crimes") and I couldn't find anything. I guess it is easier to go after domestic abusers who are already banned under Federal law (Lautenberg Amendment) from possessing a firearm than it is to attack criminal gangs and drug-related crime in Baltimore.